New Wiper Arm & Blade Kit for 66-77 Classic Ford Broncos. Includes two wiper arms and two wiper blades. These wiper arms and blades give you a similar look to stock blades with a few modern conveniences. 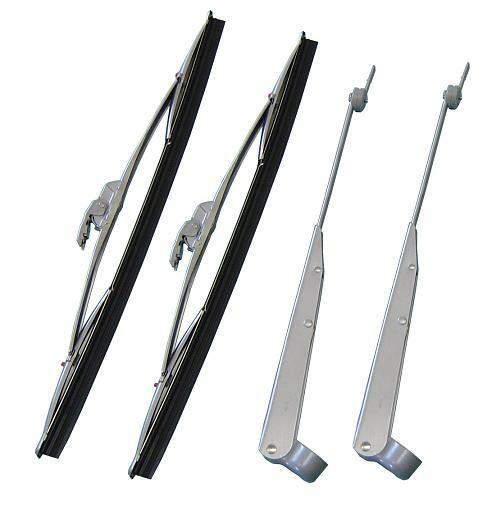 Our wiper arms are adjustable in both length and angle to ensure you get the coverage you are looking for. They also now include a flip cam system that locks out when you lift the wiper arm off the windshield to allow you to clean your windshield without having to hold the wiper arm up manually. These also include a heavy duty spring which will keep the wiper blade down on the windshield when you are driving down the highway. Fits 66-77 Ford Broncos. Includes 2 wiper arms and 2 wiper blades. Not identical to original. Paint color is similar to original argent.